Hi guys. please feel free to post any feedback or suggestions here. Suggestion: DIP switches on the VA108 to turn on/off NKRO emulation. ISO layout is in the plan. Hope you will like it. Suggestion : media controls should be moved to FN+Ins/Del/Home/End/PgUp/PgDn . This way it's more comfortable to use. FN+F7->F12 is very hard to reach. Hello, I'm from Spain and recently I've bought a Varmilo VA87MN keyboard through Massdrop. I want to give some feedback after some weeks of use so I've made a review/feedback post. I hope you find it useful. The case is really beautiful. 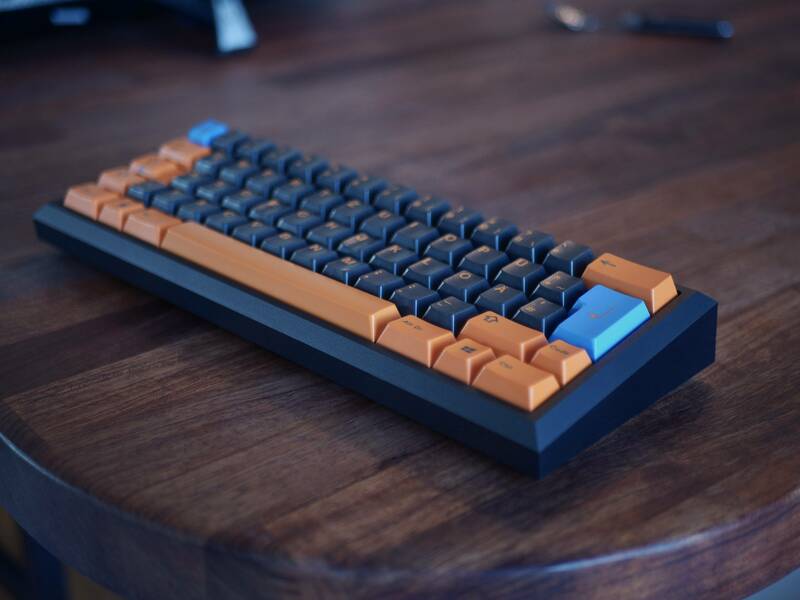 Floating keys and low profile give the keyboard a thin and modern look, compared to the classic bulkyness of other TKL cases. It is also minimalist, without decorations or weird shapes. Beautiful and timeless. I don't see much room for improvement in the looks department. Maybe adding more color choices and/or an aluminum case option would be nice. The cable routing options are fine, but I really don't need the ones on the side. I would have preferred them in the back too, on both sides. But hey, more options is always a good thing. Gateron browns are nicer than expected, they are really smooth. Being able to choose Cherry MX or Gateron switches is a great plus. Switch orientation (LED on south) is different from what I was used to, and raises some observations. - Keys on this orientation feel a bit more wobbly when you push them forwards (not down), compared to the inverted switches (LED on north) I've used on other keyboards. This is a bit more noticeable with Gateron switches. - Tactile switches, specially MX Brown and Gateron Brown, feel a bit different on south orientation compared to north. Maybe the bump is more noticeable? It's hard to say, but the difference is there. - LED on south orientation limits the choice of backlit aftermarket keycaps. - The normal switch orientation of the Varmilo keyboard has it's advantages too. It allows correct lighting of front printed keycaps (which some may prefer) and also allows the little window on Lock keys to shine, which, by the way, looks very nice too. Stabilizers are great. I have other boards with cherry stabs that are very inconsistent, ranging from OK to terrible inside the same board (for example my Ducky Shine 5), but the stabs on the Varmilo are (all of them) almost perfect. This makes a huge difference, big keys feel much better and they give a high quality impression. Great quality keycaps, love the thick PBT. And the cherry profile. And the texture. Dye sub quality is very nice too, characters are very defined without bleed. Such quality keycaps is not something you see on most stock keyboards. Most brands use thinner ABS keycaps, from smooth laser etched backlit keycaps (Corsair, Coolermaster, Ducky etc.) to the newest doubleshot grainy backlit keycaps (Vortex RGB, Ducky etc.). Varmilo keycaps, while not backlit, make the keyboard sound better, feel better. And they last longer. In the end, they make the keyboard feel more "premium". Not everything is perfect though. 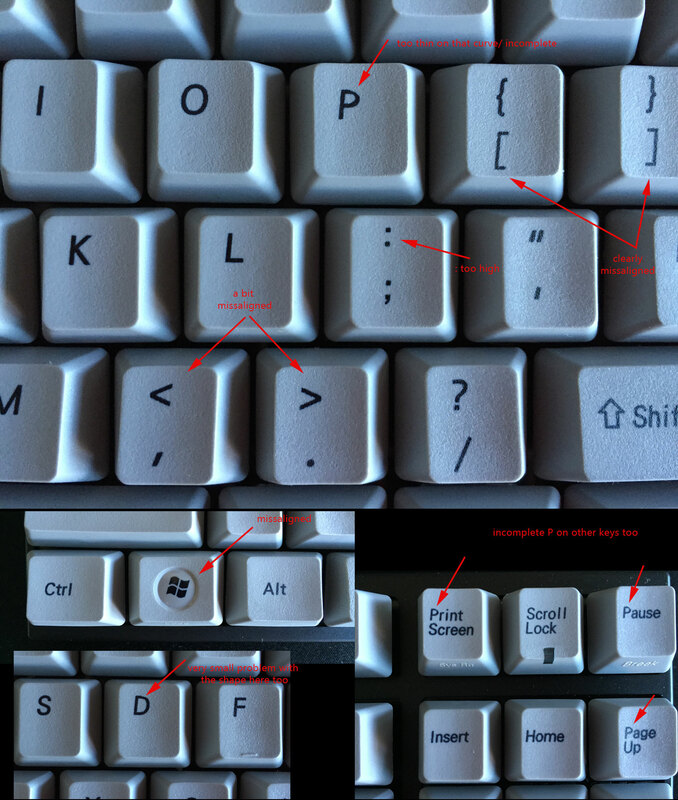 Some keycaps have the legend a bit misaligned or slightly distorted/incomplete (see image). This is something easily visible and Varmilo should be a bit more meticulous about these errors. I like the symbols used on the keycaps (arrows on shift, enter, backspace, tab, etc) and how they are placed, but I still don't like the font being italic. The shiny dome on the Windows keys is kinda ugly. It screams Windows Vista, and that is not a good thing. I think Varmilo should get rid of it. They should also update the Windows logo to the latest Win8/10 version (I think they've already updated the symbol on the newest batches). Media keys is a must have nowadays, but the location (F7-F12) is not very good because they aren't easy to reach. Mute (Del), Vol- (End), Vol+ (Pg Down), Play/Pause (Ins), Prev Track (Home), Next Track (Pg Up) are a better choice and easier to reach. This also has an advantage: It frees all the F keys, so Varmilo could add on the future a way to manually program them with macros (For example Fn+F12=Calc, Fn+F11=Explorer, Fn+F10=Mail, etc) or extra functions (repeat rate, delay rate, etc). There is other problem I've found with the media keys. If I keep pressed a volume combination (Vol+, Vol-) it only sends a signal once. You have to press fn+f8/f9 repeatedly to raise/lower the volume more than 1 tick. The ability to change caps lock and ctrl, Win key locks, and move Fn to the left side is very nice too. I dont't use them personally, but I know many people find this very useful. And I'm sure they could offer more insight on this than me. If something, It would be very nice if you were to include two more keycaps for the alternate placement of ctrl and caps lock. The LED lighting modes are nice, and the brightness adjustment is very intuitive. But a few more modes would be great, specially a reactive mode (light&fade the pressed key) and a customizable mode. 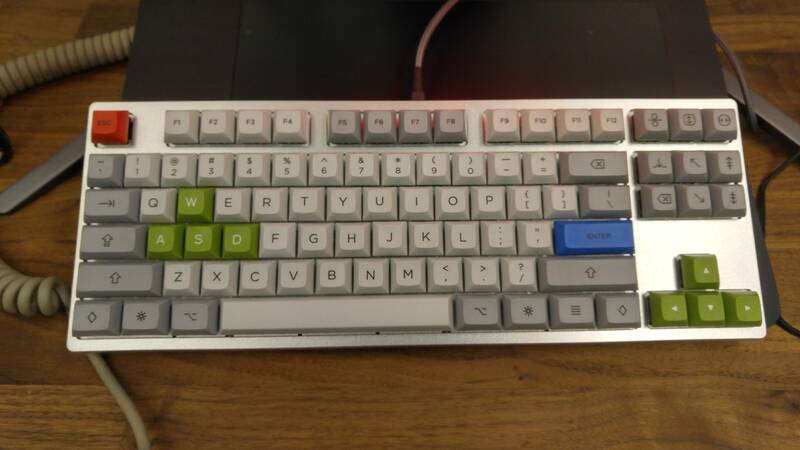 I have my cherry green Varmilo VA87M for nearly two years now. Despite having 5-6 keyboards, this till one of my daily driver. Very solid build quality, and comes with high quality pbt key caps as well. No comment on the layout since its standard tkl wk. 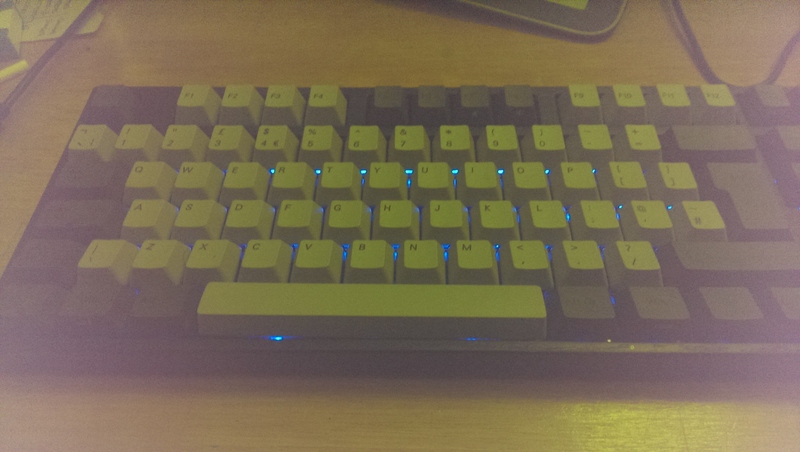 i got a aluminum case for it on MD and a granite set, i tried all profiles of caps on it but finally i find dsa profile suits me best on this low profile keyboard. I've bought a few keyboards from you now Miya. Top notch service and the quality of the product is fantastic. I have no complaints. (Well yes one. You said I would get the new logo on my latest keyboard but I got one with the comic sans font) - But in the grand scheme of things I am beyond impressed with your knowledge and commitment to excellence. My only hope is that you will expand your switch options. If I could get a VA68M with Feelio's I would be beyond happy. Wow. From final payment to first attempt of delivery 4 days. Paid Sunday and would have got it yesterday if I was at home. I love the board and I will order a 2nd one someday. Hello, friends! This is Cynthia, new contact from Varmilo, sorry to inform you Miya had left our company. Could anybody tell me how can I be the starter of Varmilo forum instead of Miya, I sent message to Geekheck team, but few days past, no one replies me. Any one can help me? On the Geekhack index page scroll to the bottom. You can see a list of members currently logged in. Those with blue or purple names are mods or admins - you can click their name and then send them a PM (personal message). Edit: There's also this list of mods and admins. When can we expect VA69M in ISO (UK)? Would looooove an RGB version of the VB87, and keep the south LED orientation, as I like windowed keycaps! Also, maybe an aluminum case (offer in Silver and Charcoal Gray), but nonfloating keys for the VB87? Replace USB mini with USB micro, located between the F12 and Prt Sc key. Should also work in USB cabled mode. That would be endgame territory for me. Just thought I'd pop in my tuppence worth as an IT Professional and a published author writing a lot (current book before editing down is 330k words!). I spent several hours reviewing and testing keyboards yesterday at The Keyboard Company (Filcos, DAS Keyboards, Realforce RGB, Cooler Master, Type Heaven, 105UB and Varmilo) and the choice came down to two for me: The Realforce 105UB ISO UK layout or the Varmilo VA69M Ice Blue. I loved the clack, the PBT, the frame, essentially EVERYTHING about the UK version of this. The ice white keys and blue backlight are really nice as well. The ONLY thing that swung me to buy the much more drab, normal Realforce was the Topre switches, which were sublime. I loved the blues on the Varmilo but Topre are just better for me for pure typing. Basically, if you had also offered this with Topre switches, I would never have bought another keyboard again. The Varmilo was pretty perfect for me in build quality, size, feel, keycap material and size, backlighting and extras for a bit of gaming (I use a keypad more) and a LOT of typing. But… Topre wins out over blues long term in feel. I'd probably buy both, to be honest. The Realforce board is much more basic, but it was the switches. For a writer/author you just can't beat them. So - would you consider a "writer's edition" of the ice blue with topre switches instead of blues? Because I'd buy that immediately and recommend it. Indeed, TKC are really excellent people to do business with. I really cannot recommend them highly enough; they know their stuff, have keyboards to try, dedicate time and care, and are all round very nice people. Oh, one more thing... Micro Usb, preferably slightly recessed. Feels a (little!) bit plastic-y to the touch, yet has a reassuring weight to it. A little lighter than my Ducky Zero. Feels to have a reasonable build quality and sturdy frame. There is no suggestion of twist or flex when handling the keyboard and its heavy enough to not be easily disturbed. I chose Cherry Browns. Nothing much to say here, I got what I expected. Only thing worth mentioning is that with PBT keycaps on the switches feel a little lighter than they do with ABS caps. This threw me a little until I figured out it's simply the heavier caps. Sadly, mine has terrible pinging. Covers approx 50% of the board. My alpha keys mostly sound fine, but the space bar in particular and the numpad keys sound like I'm playing on a springboard. Some are louder than others, some only ring slightly, some don't ring at all but just sound smooth and firm. It gets noticeably worse when using the keyboard on a hard surface, or propped up on the legs. Sadly the ones that do make such a noise have distracted me to the point of returning the board to the vendor and asking for a refund. It's a shame because it's otherwise it's a very satisfying board. - Came in lovely packaging, with a very sturdy feel to it. - Five weeks from order to UK delivery - not bad but the France -> UK part took less than 20 hours once it was finally underway. - USB cable is detachable, slightly recessed, gold-plated and branded with the Varmillo logo. nice touch. - Wood effect is quite nice (doesn't look tacky) but it would be good to have a non-textured option. - Included additional keys for the Caps-, Scroll- and Num-Lock with clear windows on them to denote toggle status via the LED. Really liked this and swapped them out immediately. - The Windows (super) key does *not* have the raised circular bevel, thankfully. It is a regular, flat key akin to the ones on either side of it. I personally prefer this and had been a little worried it would be the other type. Hey there, I got a VA68M with cherry mx blue switches and want to change them to khali thick gold - any word of advice?